Pecorino is a famous Italian hard cheese made from ewe milk. One of the most famous varieties is Pecorino Romano, also popular outside Italy. It is a zesty cheese, kind of in the league with matured Parmesan, only saltier and with a kick. 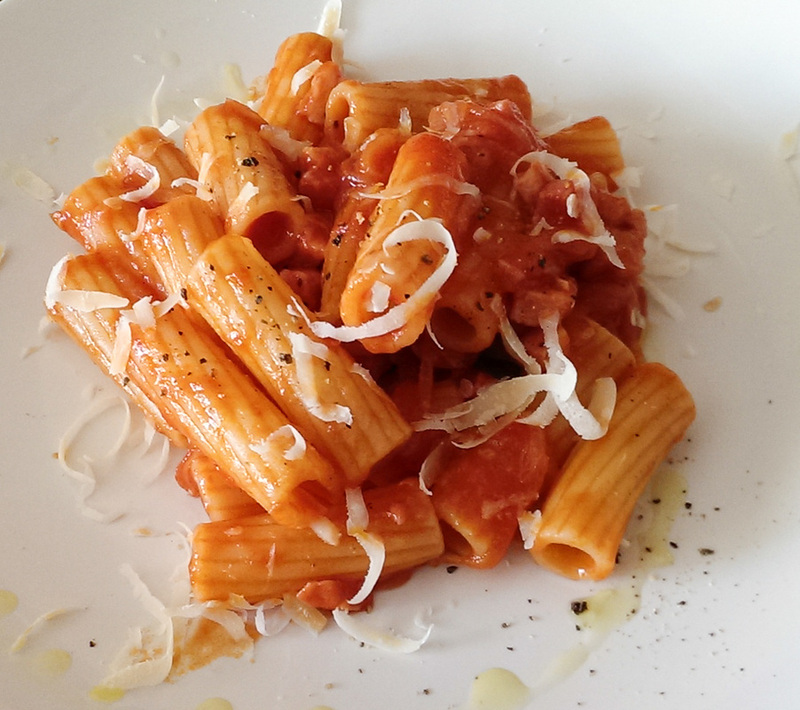 Amatriciana is one of the most well-known pasta sauces in Roman and Italian cuisine. It is a slightly spicy, yet utterly irresistible dish. Traditionally, it is prepared with guanciale (cured pork cheek) and served with bucatini, a thick hollow spaghetti. This is my simplified version of it, using only bacon and rigatoni. Enjoy! Finely chop parsley and garlic (you can also use a garlic crusher) and slice the chilies. Cut the anchovies in small pieces, pit the olives and then slice them. Soak the salt packed capers in cold water to rinse off the salt. Heat a tbs of olive oil in a pan and then add the chopped garlic and the red chili. Fry until garlic turns shiny (make sure NOT to burn it), then add the anchovies, stir fry until they melt. Then add olives, capers and half of the chopped parsley and stir fry for a few minutes before adding diced tomatoes. Leave to simmer on low heat for 15 minutes, then turn off and leave covered in pan. Once the sauce is on, pour at least 1 liter of water in a stock pot and bring to boil. Once boiling add a scant handful of coarse salt and throw in the rigatoni. Very important: follow the cooking time instructions written on the package, as pasta has to be al dente!! When rigatoni are done, drain the water well and toss them with the sauce in the pan on low heat for 1-2 minutes (just in time for the pasta to absorb the sauce well). Serve immediately with a sprinkle of grated pecorino and a drizzle of olive oil.